I hope you all survived the Christmas season. It can be pretty overwhelming dealing with extended family members, eating too much food, and dealing with the mass of new things that you suddenly acquired in one day, especially if you have kids. If you’re stuck trying to figure out where to put it all now that it’s January, never fear! I’m here today to help you figure out how to declutter your house. I understand it can be hard to get rid of things, but if you’re ready to get serious about decluttering, then there are tricks you can use to help you get rid of some of the tougher items. Maybe you’ve made a resolution to tackle the sea of clutter in your home this year so that you can breathe a little easier, or maybe you simply want to get rid of a few things to make room for that lifelike porcelain baby doll and banana bunker that Aunt Pearl got you for Christmas. 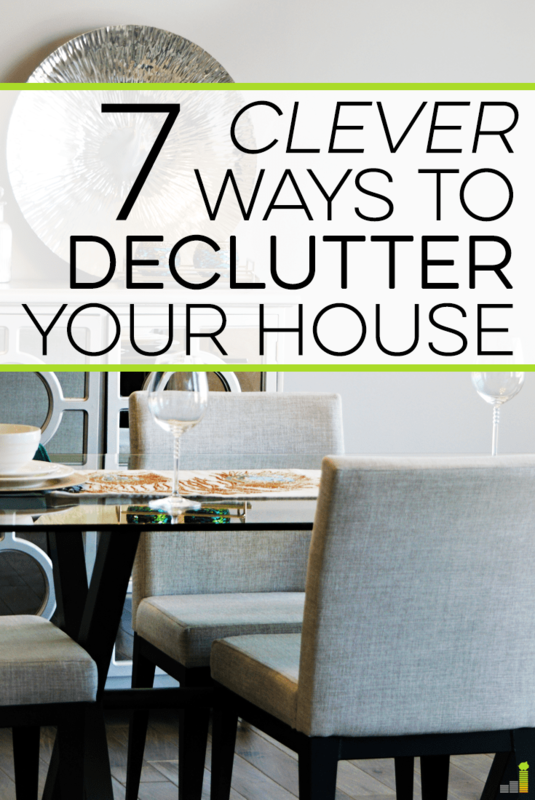 Whatever your reasons, here are seven clever ways to declutter your home. Pretend you’re going on an exciting adventure overseas, and you are going to move to Fiji (or your paradise of choice.) You can only take so much stuff with you, so what will you bring? Look at every item in your home and ask if you would take it with you when you move to Fiji. Is each item Fiji-worthy? If not, let it go. A different (but not quite as fun) approach is to pretend there’s been a fire or theft and you’ve lost everything you own. What would you actually pay to replace once that insurance check comes in? Would you replace that set of Christmas china that gets used once a year (when you remember to pull it out?) Would you replace those boots that always pinched your toes? Or that sweater that made you feel fat? I doubt it, so now’s the time to ditch them for good if you have too much stuff. One of the easiest spots to declutter is your closet. If you’re honest with yourself, you can quickly determine which items of clothing you actually wear on a regular basis. If you struggle with this, though, try reversing all of the hangers in your closet. When you wear an item, hang it up the correct way. After six months or a year, discard anything that is hanging on a reversed hanger. If the hanger method doesn’t work for you, pull out those iffy pieces that you never wear, and make yourself wear each piece throughout the next week. Notice how each piece makes you feel. If something is ill-fitting, too itchy, too fancy, too ostentatious, or if it doesn’t suit your lifestyle, then toss it. There’s a reason you don’t wear it often, so why keep it if you don’t love it? Walk into each room and think about what strangers see when they step in. Does each room feel spacious and comfortable? Or does it look cluttered, untidy and smothered? Is it a room you’d want to stay in if you were a guest in your house? Try to see it through someone else’s eyes. I sometimes catch myself looking at other people’s things and wondering why they have them, but then I remind myself that I also have plenty of things that I keep that others wouldn’t understand. (Why else did I hang onto that janky old snow globe?) We make emotional attachments to the items we keep and no one else has the same attachment to our things that we do, so picturing it from someone else’s point of view can definitely help in the decluttering process. If you have a yoga mat that you never use, skinny jeans that haven’t fit for years, books that you’ve never read, or scuba gear that you kept in the hopes that you would become a master underwater diver, it’s time to be done with your wishful thinking. That’s not helpful. Tell yourself that you probably aren’t ever going to read that/wear that/take up that hobby. If you truly wanted to do those things, you would’ve done them by now. Let go of the would-bes so you can make room for things that do matter to you. You’re awesome without that stuff. It’s time to let it go. Once that 30 days has passed, don’t open the box. If you can remember an item in there that you still need, then take it out, but if you can’t even remember what’s in there, donate the unopened box. You won’t miss the items, I promise. Think about how you wish each room in your house looked. In your mind, would they look spacious and clean? Would your closet be stuffed to the brim and your kitchen cupboards have storage containers spilling out of them, or would the clothes hang with breathing room and the shelves in your cupboards be nice and organized? Whatever you picture in your head, make it happen. That doesn’t mean you should go out and buy a bunch of storage systems; buying more things to corral your other things doesn’t help. Rather, start getting rid of the items you use the least or not at all. For items of sentimental value that you choose to keep, make sure they have a place of honor in your home, where they can be appreciated every time you lay eyes on them. If you keep a memento in a box in the attic, where it attracts musty smells, bugs, and dust, do you really love it that much? I don’t think so. Pick your treasures from the attic to display proudly in your house and discard the rest. 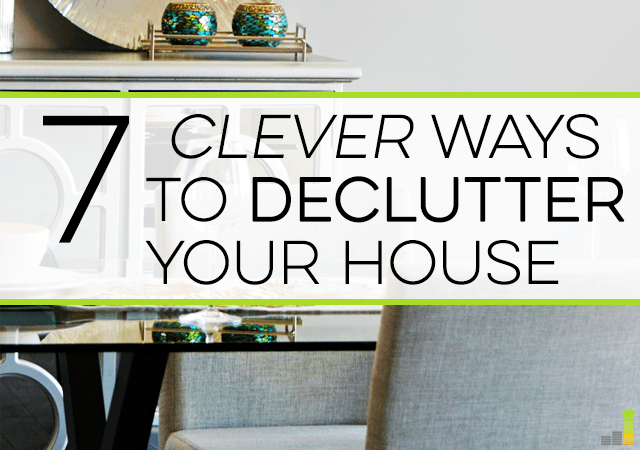 I know it’s easier said than done, but decluttering doesn’t have to be drudgery. You can absolutely make it fun, and you will feel so much lighter when it’s all said and done. If you keep items without knowing why, then it’s just weighing you down mentally. You’re paying to maintain it, store it and you’ll come across it again each time you declutter. Why waste all the mental effort? It’s time to realize that you own your stuff, not the other way around. Do you have trouble getting rid of things? Do you keep a lot of sentimental or “just in case” items? What’s the last room you decluttered and why? We just got rid of about half of my kid’s toys. They weren’t thrilled, but they do “get” that we can’t keep everything forever. Decluttering is easy for me because I hate stuff! I am in the same boat. Too much stuff makes me anxious! You are ( if not very careful ) setting them up to be hoarders. I used to tell mine that we are sorting out all our things for children that do not have anything and then let them decide what to give. You probably are doing that.. but just in case you are not I thought I would mention it..
My sisters 5 children are hoarders due imo to the way things were done when they were small. You need to establish a firm threshold on what gets kept versus what gets discarded and stick with it. In the past, I’ve decluttered and kept a lot based on the idea that ‘I might use this someday’. In my most recent project, I bumped this up to ‘ I will likely use this someday’ as the minimum requirement. By sticking to that, I was able to discard or donate a lot more than I would have otherwise, and so far have not missed a single item! That’s a great idea, and one that I’ve never tried before. I’ll have to use that method on my junk drawer soon. Thanks for the idea! 6 years, ha! I know the feeling, though. My husband is the same way. So frustrating! We just filled up two boxes of stuff from my daughter’s closet and did touch up painting in her room. I know paint does not equal less clutter, but I swear having everything looking new is making her keep her stuff more organized. I think it helps in that you want to keep it looking new and fresh. I just repainted my daughter’s room this year, and the transformation was so refreshing. We are definitely planning on some fresh paint for our girls’ room. Every time we mention that a big girl’s room wouldn’t have quite as much (fill in the blank), they agree almost immediately. I rather think that I’m going on an extended vacation. Thinking about losing things in a fire or theft is too depressing. I started getting rid of some clutter last year, but I still have stuff that I don’t really need. I’m going to follow some of these tips and see if that helps. Despite my best efforts, I do end up accumulating quite a bit of clutter. I usually keep supplies for potential craft projects or clothes for wearing at a future date and I can see my wardrobe and drawers are slowly filling up with things I rarely wear or use. I’ve created a new rule – if I haven’t started the project in over 6 months or worn a piece of apparel over two seasons, I discard it. Slowly, things are getting back to order. That’s a great rule to use! All great tips. I especially like discarding clothing that you no longer use. Everyone has a closet full of clothes, many not used often. These can go to Goodwill or other charities and hopefully help someone who needs them. And I find that starting the decluttering process in your closet is often the easiest place to start. Thanks! It’s a pretty effective technique. As for keeping it in the attic– maybe you could just use a top shelf of your closet or something, so that when the 30 days is up, you won’t forget about it. These are great tips! I just completed a quarterly clean sweep where I get rid of things that we haven’t used recently. Once we finish up our renovations, I’m committed to a more thorough “Fiji-style” clean up. When we removed everything from our kitchen cabinets I managed to get rid of quite a bit, but I know I’ve got bins of sports equipment, old clothes, and a few boxes of electronics that need to go. That’s the best way to do it is to remove every item from whatever it is that you’re cleaning out, but sometimes that’s easier said than done! I like the wishful thinking tip. I last moved a little over three years ago and I’m starting to realize there are some things I have that I haven’t looked at or touched in the entire time I’ve been in house. Time to purge! I’ve never heard the fire/insurance thing before, but that’s a really good idea! I read this whole article thinking of “Hoarders” though. Man, that’s my worst nightmare. I would hate living in one of those places. Thanks, James! And yes, that would be a nightmare for me as well. Getting the perspective of others in our house would really make a difference in decluttering. Thanks for this tip, Robin. I definitely need to declutter after Christmas and I’m going to follow your tips. I’m going to pay extra attention to your tip about seeing the house through a stranger’s eyes as we’re hoping to put our house up for sale in the springtime and this could be really useful.